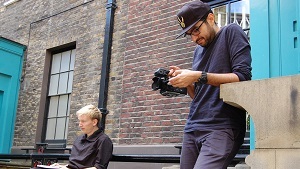 A detailed breakdown of the 3-week Directing Summer School with Udayan Prasad. A girl drops a handkerchief and a boy picks it up. Do the boy and girl know each other? What is the nature of their relationship? What do they want? Why did the girl drop the handkerchief? Was it accidental? Deliberate? When did the boy see the handkerchief? As she dropped it? Or after she had dropped it? Does he return it? Keep it? Discard it? What does the handkerchief signify? Did the boy and the girl expect to see each other, or did they come upon each other by chance? Whose story do we want to tell? The girl’s? The boy’s? A third party? Everything begins and ends with the story. 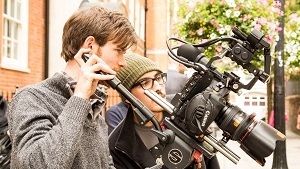 Each participant will begin by shooting an exercise, impromptu, set in a single location in Covent Garden. The films will be edited and reviewed with a professional screenwriter, followed by a masterclass on script. While taking part in acting workshops, each participant will then write a short script based on the ‘Dropped Handkerchief’ scenario. The scripts will be subject to rigorous constraints in locations, number of set-ups and camera movement. The group will recce and prepare for their first shoots with a production manager, under the supervision of a director of photography tutor. 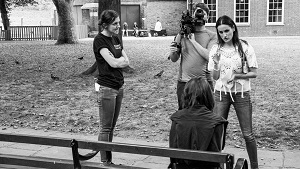 In week two the participants will split into three groups of four to shoot their scenes. 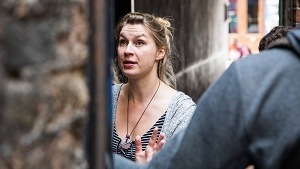 In order to understand what an actor requires from a director, participants will fulfill the roles of both actor and director, reversing roles with their fellow participants. After a review each group will be provided with an editor and a private editing suite, taking it in turns to prepare their first cuts. The twelve films will be reviewed as a group with a screenwriter, supervising editor and director of photography. Every decision made at each step of the production will be carefully scrutinised. Each participant will then revise their ‘Dropped Handkerchief’ script in the light of this experience. Light, space, colour, framing and movement by a Director of Photography. Choice and manipulation of space by a Production Designer. The use of Sound and Music by a Sound Designer. The art and function of editing by an Editor. Week three is where everything gets drawn together. Each participant will re-shoot their handkerchief scene, this time with professional actors and sound recordists. Participants will be expected to apply all of the lessons learnt from the first two weeks to produce a piece of work which reflects their learning at LFS. And finally...the course will culminate with a dedicated screening day where all twelve final films will be thoroughly reviewed, analysed and discussed. The participants will welcome back the team of professionals who have been advising throughout the course for their final thoughts and feedback. This programme was gold to me. Jam-packed with brilliant masterclasses, on-shoot advice and real life examples one could imagine applying to all departments of filmmaking. Get ready to discover your inner artist and open up to inspiration like never before in an intense, terrifying, exhausting yet absolutely unforgettable and fantastic three weeks. If someone is passionate about films but not sure of directing or the exact aspect of filmmaking they want to be involved in, then I would say this workshop is a great starting point towards self-discovery. You will be surrounded by peers and instructors who are equally (or more) crazy about films as you are. I would say it is a must attend course for anyone that is thinking about becoming a director. It is an eye opener to key skills required on becoming a director. Udayan is an excellent tutor. The classes on acting were liberating. We got a better understanding of how to communicate with actors, and the importance of providing clear directions to allow them to do their job. It's given me an ability to make room for improvisation in my work. I have a faith in actors that I didn't have before. This programme does not simply offer a taste of the various components that make a film a film. It is a hands-on leap into the craft; a thorough exploration guided by wonderful tutors in a friendly, supportive and helpful environment. What was incredible about this experience was the passion and the love that all the mentors had for their subjects, and the power with which they could transmit it. I realised that before the Summer School, I didn't really know what being a director was. I would recommend this experience to everyone. It was much more than learning how to direct or work with actors; it was learning how to make a story understandable, how to work with your cinematographer and with post production, and how to answer all the questions asked before, during and after the shoot - all of this to help make your story. I left knowing a lot more than anticipated.